1. 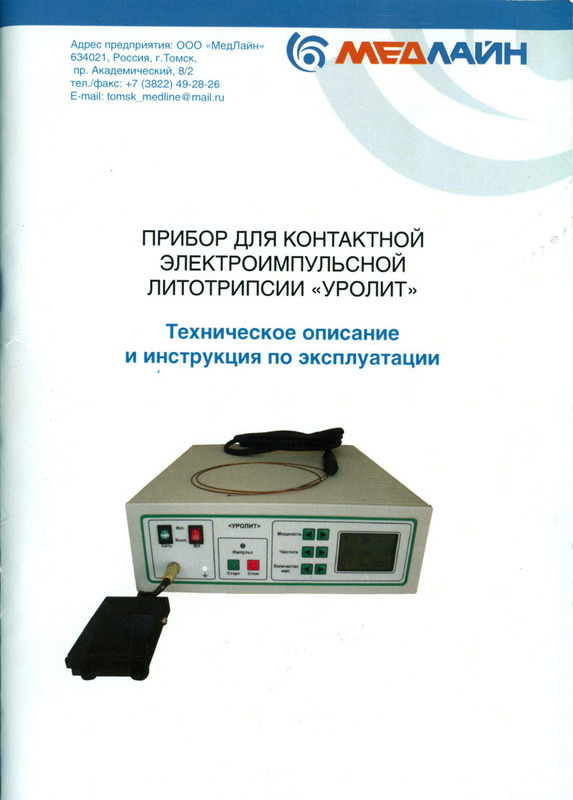 Probes must be sterilized prior to the operation in compliance with the "Guidelines for cleaning, decontamination and sterilization of endoscopes and applied instruments used in prevention and treatment facilities" (Order of the Ministry of Health of the Russian Federation No. 184, dated June 16, 1997). When sterilizing the probe in a fluid medium, it is important to not allow fluid to get onto the electric connector 12, Fig. 4. If liquid gets onto the connector, remove it by using an absorbent cloth and dry off the connector. The probe connector must be insеrted until it is all the way into the socket connector of the transmitting cable. 2. The patient is prepared according to the general procedure of preparation for endoscopic operations. 3. Lithotripsy is performed under intravenous anaesthetic, or under spinal or peridural anaesthesia. 4. Disintegration is carried out by direct contact of the probe tip with the calculus under direct vision. 5. Disintegration in the bladder is carried out preferably by batches of pulses (3-10 pulses) with a repetition frequency of 2-5 Hz at a power level ranging frоm 4 to 7. Disintegration of ureteral and renal concretions is carried out preferably by single pulses with a gradual power level increase from 2 to 6. 6. It is recommended to start disintegration by single pulses at the minimum power level. If calculus disintegration is not observed after several pulses, it is recommended that the power level applied to the calculus be increased using buttons 8, Fig. 2. 7. During calculus disintegration, especially in the upper third of the ureter, the use of stone extractors is recommended, which will help to avoid the migration of calculus fragments during its disintegration. 8. The calculus disintegration process may vary in time depending on the calculus type. Primary disintegration should be initiated in places whеrе its surface is inhomogeneous. Calculi with an inhomogeneous surface are disintegrated by using the lower power level. Calculus fragment size is estimated by comparison with the probe diameter. 9. After lithotripsy has been carried out, large calculus fragments can be removed with the help of stone extractors or specialised forceps. 10. Drainage of the ureter and renal pelvis with a catheter or stent must be performed after lithotripsy.